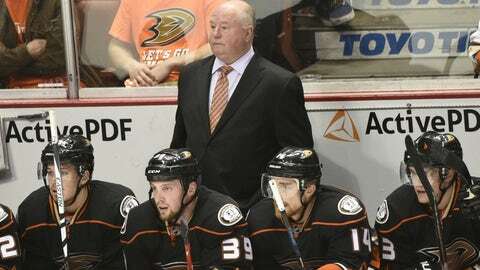 Despite the worst start in the NHL, Anaheim Ducks head coach Bruce Boudreau looks to be safe in his job. The Anaheim Ducks have gotten off to a tremendously bad start to 2015-16. With one win in their first 10 games, the Ducks’ four points rank tied for dead last in the NHL. With 10 goals, an average of just one per game, the group looks like a shell of what it was last season. I wrote earlier this week the slow start isn’t an inclination of how good this team is. It has been playing below expectations and has run into a bit of bad luck. With the struggles, many expected Anaheim general manager Bob Murray to fire head coach Bruce Boudreau, but it seems he’s taking a much more measured approach to the situation. It’s a surprising levelheadedness for a team that is dramatically underperforming, but Murray clearly sees there’s light beyond the dark. The roster is, for the most part, stacked, and there are signs the Ducks can turn things around. Through 10 games, nothing has worked out like it should, but like Murray mentioned, it doesn’t mean it’s going to be that way for the remaining 72.